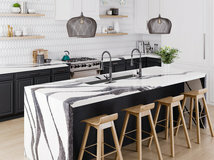 A peek at the future of kitchen and bath design could be had recently at the Kitchen & Bath Industry Show (KBIS) and International Builders’ Show (IBS), which together drew more than 100,000 people. 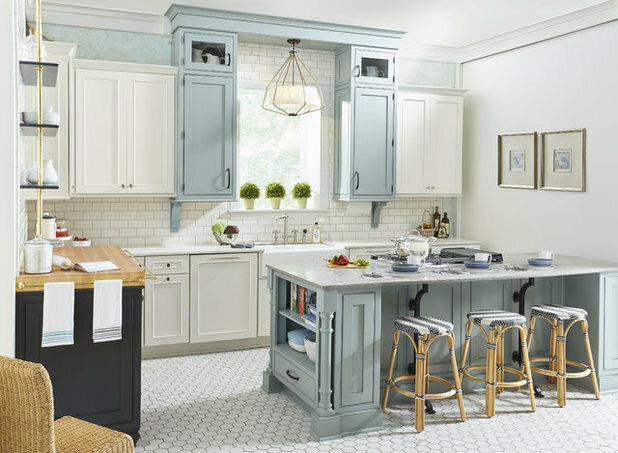 There’s something for everyone here — whether you’re into the rich, moody colors cropping up or you prefer classic neutrals such as white, gray, blue or green for your kitchen and bathroom style. 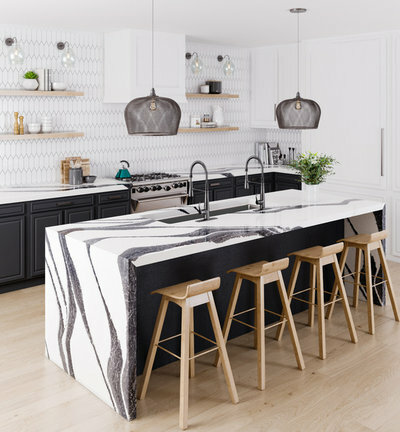 Read on to learn about some of the overall themes for color and style that Houzz noticed at the trade shows for the kitchen and bath and building industries, held Feb. 19 to 21, 2019, in Las Vegas. 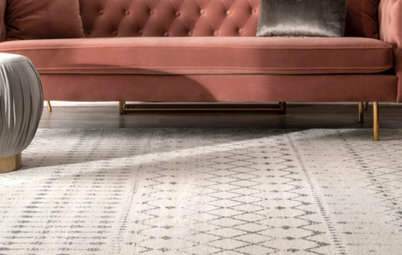 Color of the Year selections for 2019 included moodier colors than we’ve seen in recent years — and throughout the show, many moody colors indeed were on display. 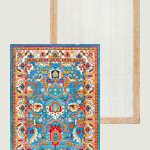 We saw them on just about every kitchen and bath surface, from countertops and cabinets to sinks and flooring. 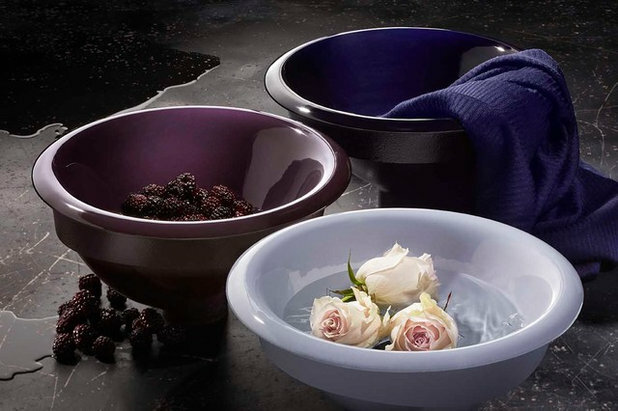 This image shows Kohler’s new Shadow collection of indigo, black plum and lavender-gray finishes for its enameled cast-iron sinks and tubs. The red room in Kohler’s booth showcased the new rich aubergine Terrazzo Renata tiles from the manufacturer’s Ann Sacks brand on the floor. 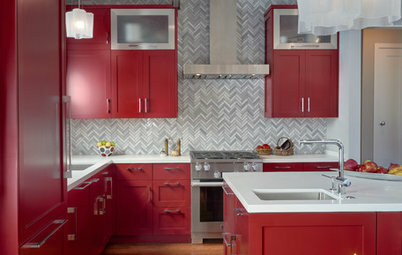 On the left wall is Ann Sacks’ new Crackle collection by Kohler WasteLab tiles in mahogany, a deep red-brown. 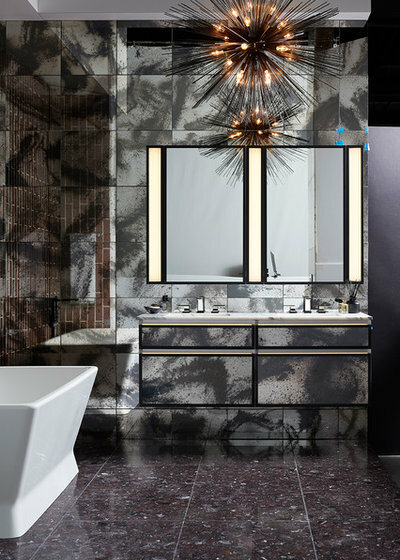 The vanity features Ann Sacks Vedere mirrored glass tiles in the silver-and-black Luna pattern. 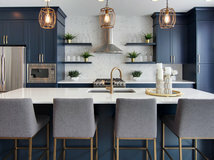 Dark cabinets and countertops were featured throughout the show, with several countertop manufacturers presenting new designs that work with black or navy cabinets. 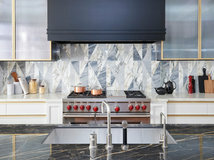 This image shows the Bentley design from Cambria’s new Black Marble collection, which was launched in response to the growing demand for darker countertop styles. 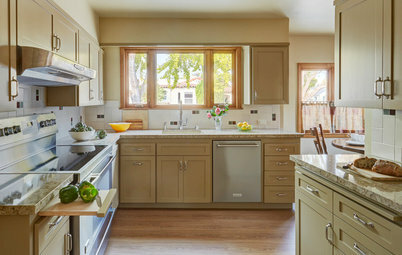 The space demonstrates an ongoing trend — white cabinetry — along with a rising one — dark cabinetry, shown on the lower cabinets and the island base. 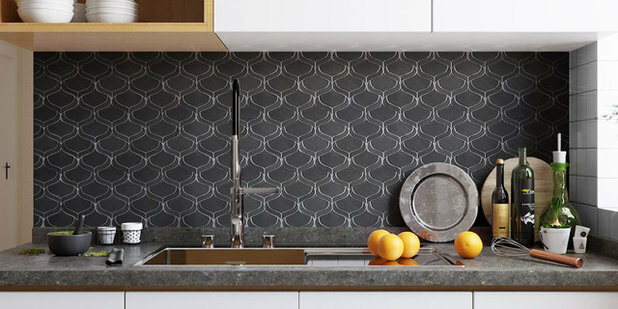 Emser’s Myth arabesque mosaic tile, shown here in pewter, was displayed at IBS. 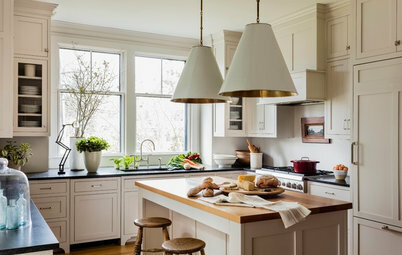 Though dark, moody colors are an emerging trend, white remains by far the most popular color for upgraded cabinets in kitchen remodels, according to Houzz research. 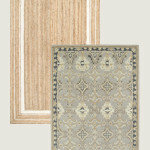 Wood is the second most popular, followed by gray. We noticed at the shows that both whites and grays are warming up, with whites shifting to warmer hues and grays moving toward “greiges.” This kitchen displayed in Wellborn Cabinet’s KBIS booth features the brand’s newly launched Oyster White color, which reads as a warm gray-white paint in person. 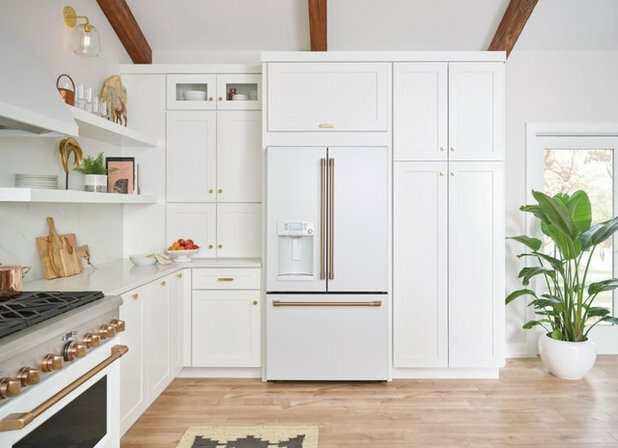 This cabinetry from the Yorktowne brand also shows the warming-whites trend, with its honeyed-white color (Safari Classic). Greens and blues also remain popular for kitchen cabinets and were seen in booths throughout the show. 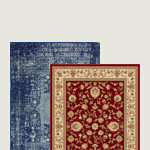 We saw them in a range of colors, from soft blue to navy and from soft sage to emerald to moody teal. 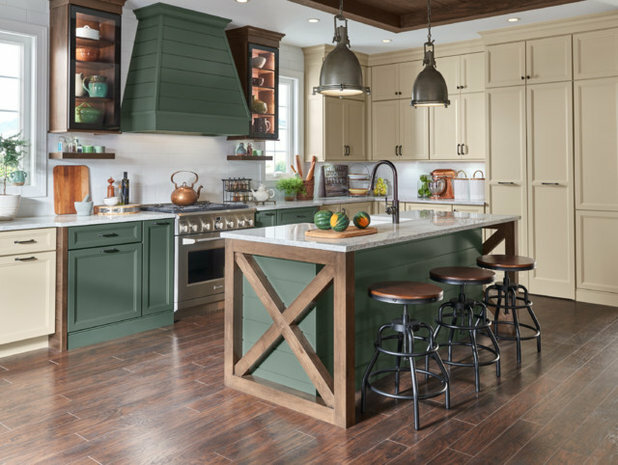 The green in this kitchen from the Yorktowne brand is called Eucalyptus Classic. 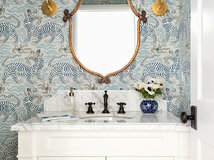 As white cabinetry warms up, tile offerings are responding. 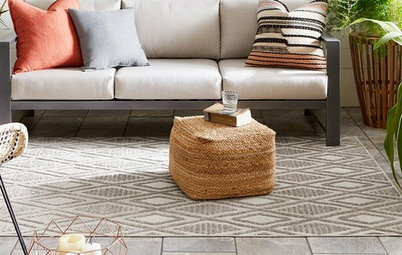 Emser Tile’s Baldocchi says whites and grays are still popular for tile, but with warmer undertones than before. 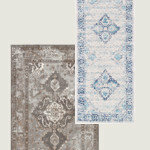 Greige is still trending but is leaning more toward beige and becoming a prominent staple in neutral palettes. 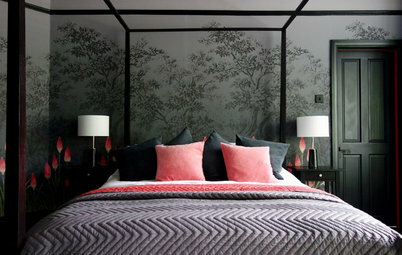 “Warmer tones are coming back into the trend palette by way of greige,” Baldocchi says. 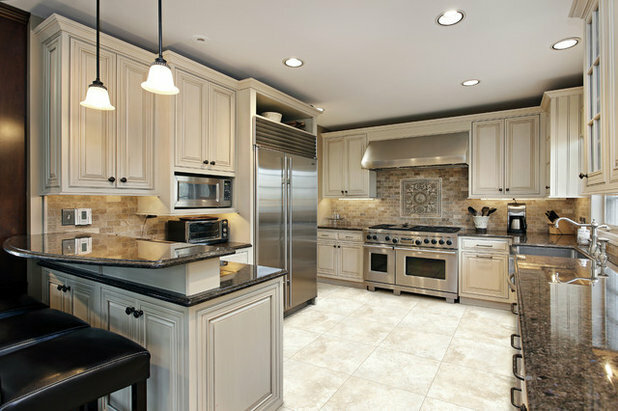 Here, Emser’s Giza Khafre glazed porcelain floor tile is paired with taupe cabinets. The tile was shown at IBS. 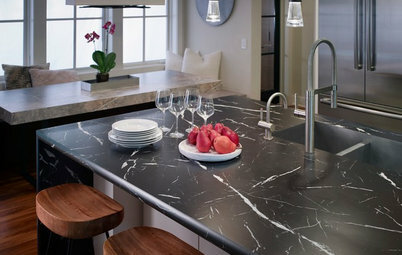 We also noticed countertop makers creating new designs that pair well with navy cabinets. 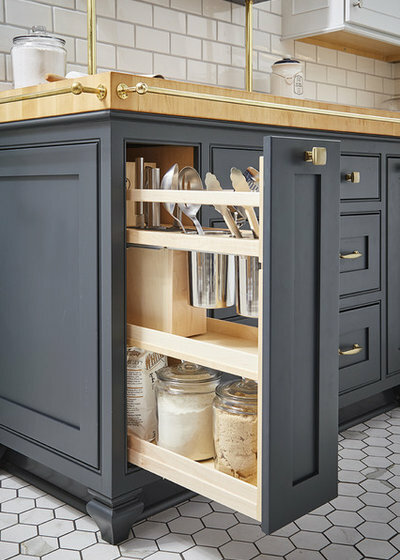 In many projects, navy is used on the lower cabinets and white on the upper cabinets, as shown in this kitchen at Wellborn Cabinet’s KBIS booth. Transitional style blends and balances elements of contemporary style and traditional ones, and many exhibitors featured this happy-medium design style. Shaker cabinetry is a natural fit for transitional-style kitchens and was on display at many cabinet manufacturers’ booths. 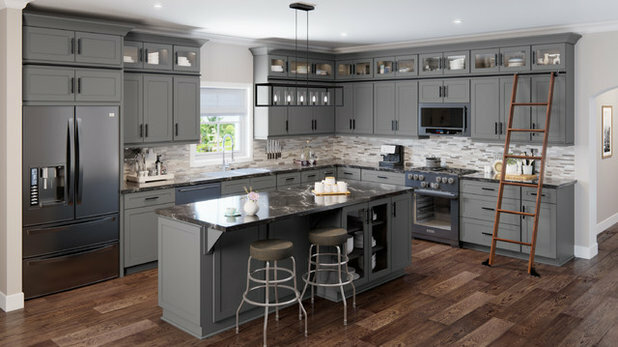 The kitchen shown here is from US Cabinet Depot; featuring gray Shaker cabinets, it could be characterized as transitional, with on-trend cabinet style and color plus a backsplash that veers contemporary. 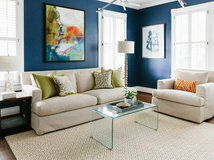 Houzz research shows that while transitional style is the No. 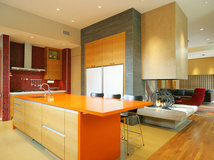 1 choice for remodeled kitchens and contemporary is No. 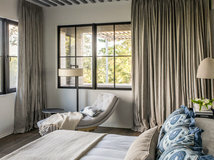 2, farmhouse is nearly as popular as contemporary style. 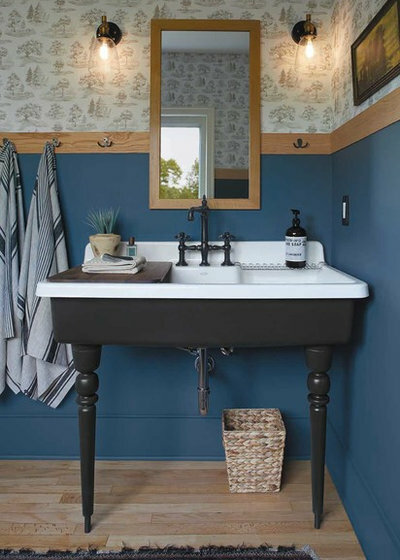 Farmhouse style has also been gaining fans among homeowners who remodel their master bathrooms, according to Houzz research. 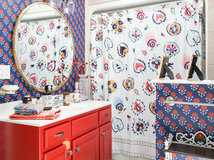 Products debuted at KBIS underscored the expanding influence of this design style. 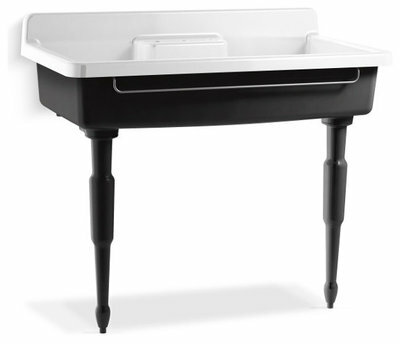 For instance, Kohler this year debuted its Farmstead sink, which offers a fresh twist on a mainstay of farmhouse style: the apron-front sink. 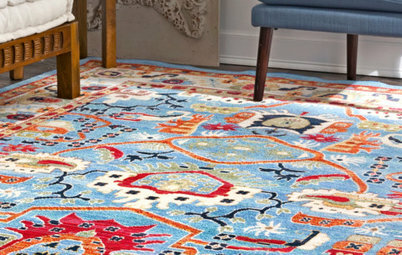 This photo shows the option with turned spindle legs, a style that would fit traditional or transitional style. 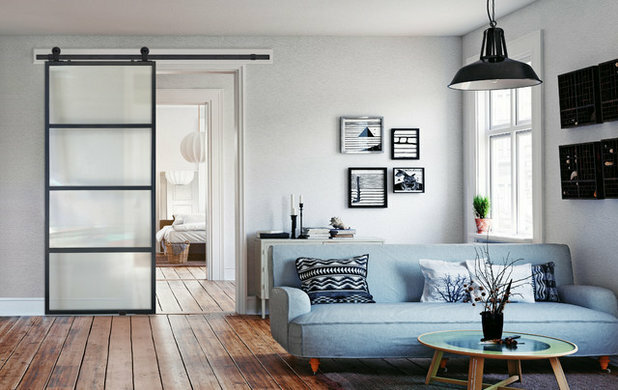 Another mainstay of farmhouse style is the barn door. In this example from GlassCraft Door’s BarnCraft brand, the farmhouse classic has been updated to fit a more contemporary design style. We saw other hallmarks of farmhouse style at the shows, including shiplap. 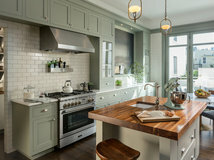 Take a look back at the photo of the Yorktowne kitchen (the one with honeyed-white and green cabinets) and notice the shiplap on the range hood and the kitchen island base. 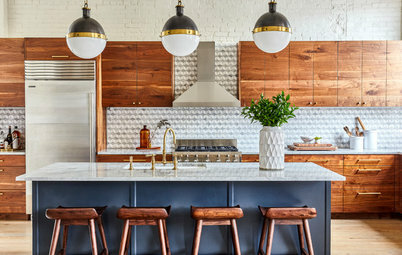 The X-style end caps — reminiscent of barn doors — on the island are also definitely farmhouse style. 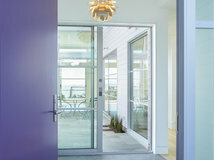 A number of brands showcased an array of colors and finishes for their products that homeowners can customize to suit their tastes. 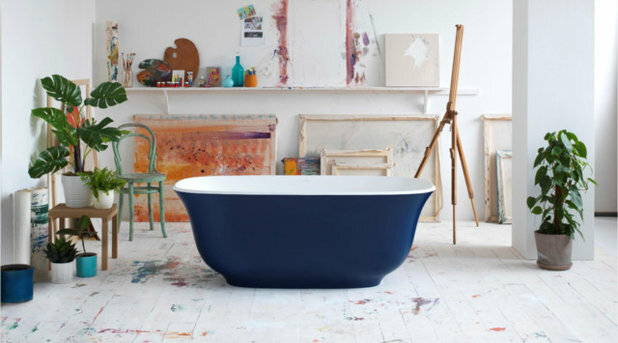 Victoria + Albert introduced the ability for homeowners to choose the exterior color of their Englishcast freestanding bathtubs (one is pictured here) and sinks from among 194 RAL colors, in addition to six existing paint finishes and natural white for the tubs and sinks. 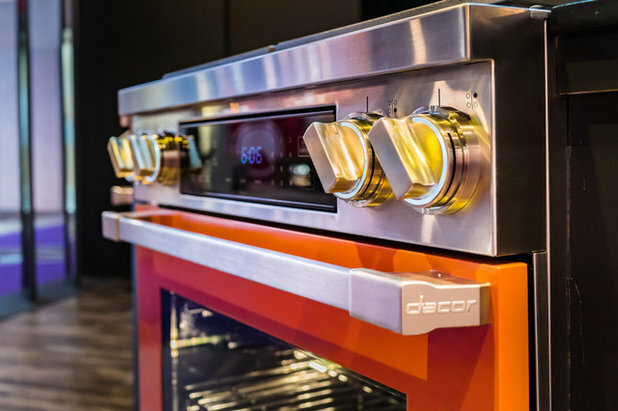 Dacor highlighted its DacorMatch Color System, which allows homeowners to get the brand’s Heritage ranges and wall ovens in any color they choose. 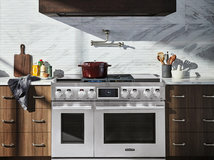 GE Appliances debuted custom handles and knobs for its Café Matte collection of ranges, cooktops, dishwashers, refrigerators, microwaves and hoods. 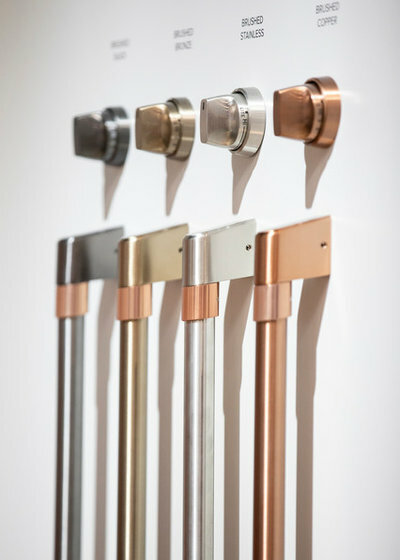 The interchangeable handles and knobs won a BIMsmith Best of IBS/KBIS 2019 award, one of just 12 products to receive the honor. 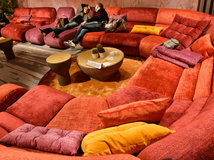 Houzz senior editor Anne Colby contributed to this report.